Commercial grade outdoor ashtrays provide an easy, safe outlet to dispose of cigarette butts. 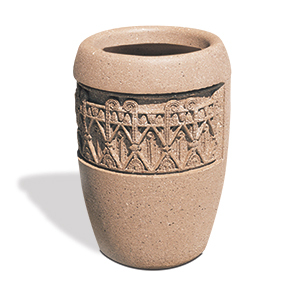 These round cigarette receptacles add an inviting splash with an intricately crafted 7" decorative cast band. The structurally sound, fire resistant, ASTM compliant, reinforced concrete ensures the units strength and durability throughout various harsh climate conditions. Available in an array of standard and premium colors and finishes. These outdoor smokers receptacles comes standard with a 10lb. bag of sand to fill the unit, a safe aid for the suffocation of any smoking material to properly extinguish.